This bundle is arguably the best bundle we've ever put together! The quality of the items included is so high you'll keep going back for more! 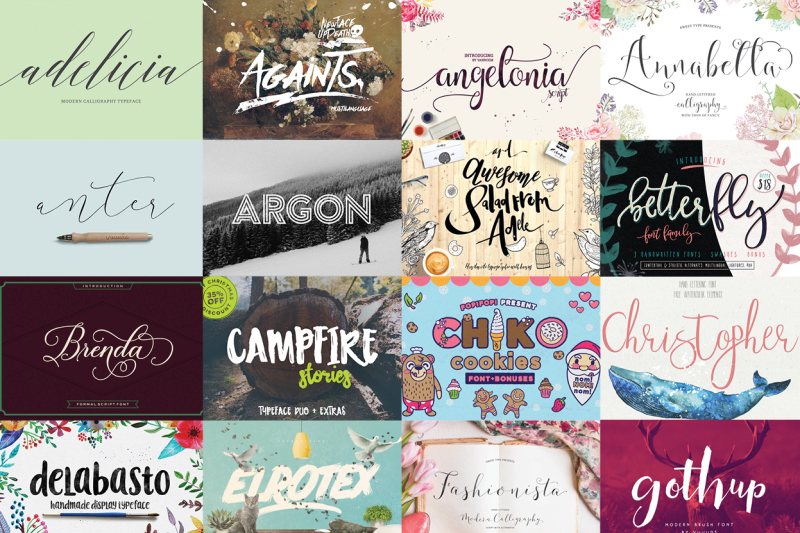 With an incredible 36 premium fonts and 15 graphics packs, this one is definitely a keeper! Take a look for yourself and remember, once it's gone, it's gone! We are starting 2016 off with one of our best ever font deals. 7. Are Some of Your Fonts Being Cut Off? Smoothline script is the first font in this months bundle. A modern touch on old school calligraphy, this font is truly beautiful and a joy to use. This script includes hundreds of extra glyphs that are accessible without the need for additional design software! Awesome is just that, an awesome font! Well actually, it's six fonts rolled into one! Fantastic fun to mix and match and combined with the hand drawn doodles you'll have so much choice. We loved the illustrations so much, we used them in our bundle header! This pack in itself shows the quality of fonts deals we will be offering in 2016. Annabella is a gorgeous font created by Emily who owns the extremely popular 'Sweet Type' design studio. You'll have so much fun creating your own hand-lettered text syles. The combinations of sweet swirly letters are endless. Quickfox is a favourite font this month in TheHungryJPEG office! So quirky and original, we can't get enough! The additional dingbats/illustrations are fun and fit the style of the font perfectly. Enjoy! So many of you have asked for Vanilla Daisy to be included in our next bundle, so here it is! An incredible font that is so perfectly made with hundreds of stunning characters, completely accessible to everyone via the additional font files. This will become a staple in your font toolbox! Wellone is a lovely script font with an edge. With its characters falling above and below the baseline, this fun and flirty typeface will keep your designs captivating! The extra swashes included as a font file compliment the glyphs perfectly. Combine until your hearts content! Chiko cookies comes in two forms, regular and italic! The cute vector pack also included is a perfect little bonus created with love by the talented designer at fopifopi. The cupcakes, donuts, ice creams and gingerbread men will force you to take a design snack break before commencing your work! Angelonia, a beautiful name for an even more beautiful font! A mix of brush font with actual handwriting, this typeface really does have everything, oh, and it even has extra characters accessible by everyone! Woohoo! Argon, a bold, futuristic, attention commanding font that will make your designs really stand out! The intricate yet stylish letters are perfectly crafted and easy to read at any size, making it a great, go-to font for those striking headers. Betterfly is an extremely popular font that usually retails for $18 alone! A great pack of three fonts, draft, smooth and narrow and a bonus set of swashes! Each letter has been lovingly created so that every character compliments the letter before it. A truly incredible font that as soon as you use it, you'll understand why it's so popular! Christopher has been created entirely by hand by the very, very talented Julia of Julia dreams designs. One of our favourite designers due to the fact that everything she creates is amazing! This font is no exception, with its dancing baseline and bonus pack of hand painted watercolour elements including the awesome whale in the mockup. Delabasto is a hand drawn font, created by painting each individual letter on paper first and then lovingly creating them into a font for you to use and enjoy! A nice straight and simple typeface with the odd quirky letter making the font anything but ordinary! Do we even need to introduce Isabella to you? We know so many of you, like us, have been lusting over her for a while now and we sure are happy to be able to offer her to you in our (literally) jam-packed January bundle! A fantastic font with so many characters and beautiful kicks and flicks that you'll be instantly hooked! Herlock, a modern display font full of attitude and packed with seriously cool design quirks. The letters work in harmony with each other to create a really fun and original design. Useful for posters, headers, stationary, invites and so much more! Mix and match with some of the script fonts in this bundle and viola! You can never have enough script fonts. That is a design fact that everyone knows! We are sure that Shania will be a welcome addition to your font book and fit in well among the other fonts included in this January bundle. Shania compliments bolder, sharper fonts perfectly, give it a try! Tynabella is a fantastic new font that is PUA encoded meaning you can access the hundreds of additional glyphs without having fancy-schmancy design software! It also includes two versions of itself, regular and and script. Have fun combing the tons of characters to create your own masterpiece! Another new and interesting font from CreativeQube. This font is a hand painted brush/marker font that has loads of character and texture for that awesome hand drawn look. Comes with an extra font file with hand painted slashes, swashes, dashes. Meet Fashionista! Contemporary and clean hand-lettered calligraphy style script. This mix of modern and classic writing is soon to be your favorite for weddings, stationary, logos and more! With hundreds of alternate letters, everything you create will be completely unique. Overture is a script font that combined brush lettering with traditional hand writing. It is multipurpose and flexible, making it easy to match with other typefaces to create some beautiful projects such as wedding invitations, vintage designs, greeting cards, posters, book covers, illustrations, etc. As beautiful and eye catching as the real Kremlin, this font is a wonderful addition to your ever growing collection of typefaces. Super original and as imaginative as true handwriting, you'll be as hooked as we are! Easy to incorporate into your designs, what's not to love? Kathya has some gorgeously thick lines and curves that really bounce off the screen when you're designing. A treat for the eyes and a pleasure to use, you'll want to design invitations even if you're not getting married! We know we did..
A beautiful calligraphy style font with tons of character. Yes, lucita really is a dream to use and so so pretty. The extra swashes with hearts are adorable and suit the soft essence of this typeface. A fantastic addition to the jam-packed bundle by VanRoem. Gullick has a thick and messy look that is so endearing adds a definite touch of 'handmade' to your designs. Gullick includes a bonus version of the font that has additional characters so that you may combine the two to create a truly unique design. Isn't Elrotex the coolest bold, brush font you've seen in a long time? We thought so too! The thick and fun swashes also included in this pack are attention seeking and pretty darn cool! Elrotex is a stand up and pay attention font that is ideal for headers! Brenda will make all of your swirly, whirly, curly dreams come true! With hundreds of them included you won't be disappointed! Brenda plays nicely with her sisters, Isabella and shania so get combining! Perfect for regal and ready for action designs. Campfire includes two font variations, the lowercase font with fun letters and an uneven baseline, with an uppercase font that compliments the smaller characters perfectly! Also included is a set of swashes that look like they could have been created with the actual ash from a campfire! Anter is a gorgeous font that we have fallen head over heels for! It's curves are delicate and flow perfectly together. 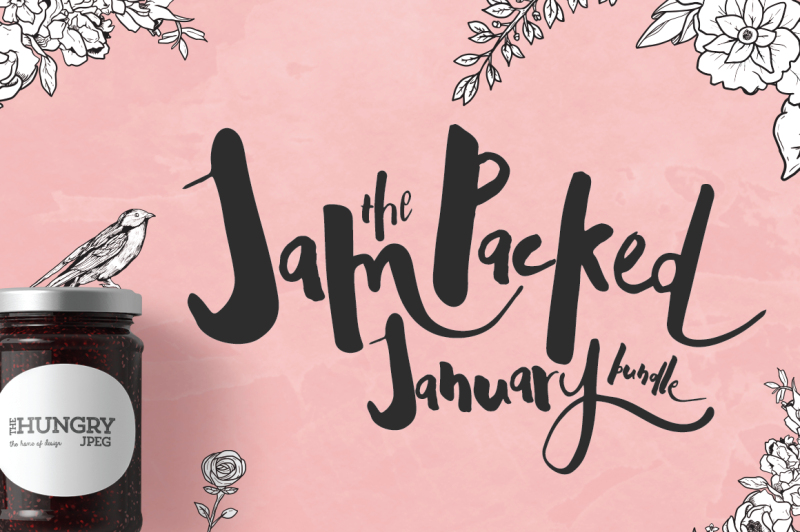 Definitely up there with our top fonts in the jam-packed January bundle even though it's so difficult to choose as we really are in love with pretty much all of them! Adelicia included four font versions, clean, slant (italic), rough and slant rough. Best when used all together for a nice textured effect on your designs or use the clean font for a crisp, stand-alone header or use the combination for some fan favourite invites! The Againts typeface has been one of the best selling fonts in the last few months and we are honoured to include it in this months bundle. Inspired by rough ink and thick brush strokes, the designer has combined the two to create this rough and ready masterpiece! Gothup, a thick, modern typeface that oozes character and just all round coolness! If you're looking for something a little different then look no further! Gothup is your font! Useful for original and not entirely perfect designs! Introducing the So Lovely script! An imperfect hand-inked handwriting script. The combination of bold curves with super-fine lines trailing as if your hand just barely lifted from the paper. So Lovely doesn't miss a single detail, alternate characters are hastily cut short as a quickly moving hand ordinarily would. Serffost is a tall and thin font that oozes charm and sophistication! Super easy to incorporate into your designs due to its versatile nature. This font can be everything to any design. Use with care, as over usage may cause serious addiction! Hurgey is a fabulous new font by the incredibly talented Vuuuds. A beautifully drawn typeface where each word typed looks as if you haven't lifted then pen from the paper at any point! A font that has lovingly been created for eases of use. Tropical Night is a scribbly hand drawn script font with loads of character. It comes in regular (which has awesome hand drawn scribbly texture) and Bold, which still has the wobbly edges but has solid fill and is heavier and darker. There is also alternates, and of course initial and terminal swashes and dashes! This font looks great on personal branding, business cards, logos and quotes. Looks great at larger sizes, so feel free to go big! Make your branding pop and come alive with the versatile worship font. Why not check out the Kremlin font, created by the same designer, these two fonts are a match made in heaven! We know, you’ve never seen anything quite as cool as this pack, right? The polar bears in jumpers are just adorable and the whole ‘arctic space’ theme is simply magical! We wish this land was somewhere we could visit but for now we will settle for having these awesome illustrations, textures, pattern, catchwords and more! Who doesn’t love watercolour flowers and who doesn’t love antlers?! Well, combine the two and you have a watercolour heaven! How darn cool are the wildflowers all bunched around those mean antlers, I mean hello? Who wouldn’t want that in their life?! If colour is your thing then you’ll love these Autumn flowers. The designers at ‘The Autumn Rabbit’ have certainly lived up to their name and translated their favourite month into gorgeous floral displays of greatness. So much fun to use and a fantastic way to liven up any designs that need that extras bit of va-va-voom! Didn’t Elvis once say he’d have a blue, blue garden without us? Or was that a blue Christmas? Oh well, whatever he said, we’re sure he’d approve of these beautiful blue themed flowers and plants! A perfect way to illustrate these colder months and to combine with the brights included in this bundle. Come and take a look at these lovely tomatoes! The vines and flowers are pretty tasty too. This botanical garden set is great for designing menus and logos for restaurants and cafes as well as decorating your cookbooks! Have a play and see what you can make! If you’ve ever had the fortune to wander through a typically English garden, you will know that the flowers you stumble upon are mostly the delightful smelling lavender and the pretty pansies! The Autumn Rabbit has captured the essence of those garden perfectly in this fun pack. Feathers, flowers and arrows this set contains all three! In wonderful watercolour swashes, these clip art illustrations have been created with you, the user, in mind. The shapes fit perfectly round quotes of text and can really make your logos and designs come to life, try for yourself and you’ll be glad you did! These floral vector elements curve perfectly around your quotes and designs, as if they were made for them! So beautiful and perfect that we have included two sets so that you have more choice! Make sure you check out the other colour way too, we know you’ll love both, just like us! The second set of these vector elements is just as fab as the first but in a different colour way for you to choose. The flowers in a mason jar look great on greetings cards and the wreath is awesome with a beautiful quote inside. If you don’t know what font to use for your text, check out the incredible script fonts also included in this bundle. You won’t be disappointed! The sketchy look of these clip art illustrations is down to the creative art of mixing ink outlines with a watercolour fill. Great for adding a hand-drawn feel to your work and as they are so cute, you’ll struggle not to use them everywhere.. we won’t blame you if you do! These cutesy drawn cameras are so much fun and remind us of the good old days, going on holiday taking an actual camera with you as the only source of family pictures instead of the fancy phones we take everywhere nowadays! This pack is 4 funky cameras in muted colours. The second set of cameras included in this months bundle are these awesome pastel coloured delights! Four seriously retro designs that take you back to the days before camera phones and the simplicity of the aim and click era! We know you’ll love them as much as we do. This navy and blush clipart sets combines two beautiful sets of colours: deep and moody navy and pink peachy blush. Never have two colour combinations complimented each other so stunningly, until now. Due to the nature of watercolour the flowers move from light to dark and back again all within their perfect shapes. See for yourself above. Spring floral is a pack of pastel perfection! Roses that plead ‘use me in your designs and I promise to shine’ and ferns that are just dying to be part of your next project! Combine the flowers with others from this bundle and their beauty will blow you away. Summer garden is a pack of watercolour illustrations that are inspired by the beautiful buds and blooms of the warmer months! The poppy is definitely our favourite flower in this pack and just screams Summer! Sun, Beach days and pretty flowers = perfection. Items cannot be included (even for free) in the sale of another item. For example, the inclusion of a font when selling a logo template designed using this font.